Many of my image posts about Mars have emphasized how slowly things change there. This post will highlight the exact opposite. When it comes to dust devils, it appears they can leave their trace frequently and often, and for some reason they seem to also favor specific locations. 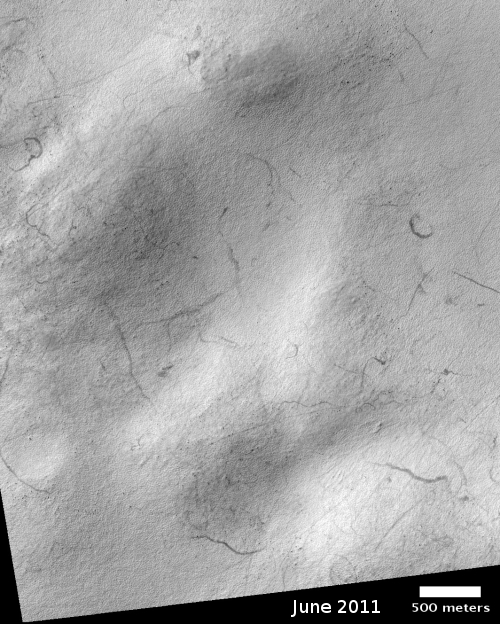 The string of images above are all of the same location in the southern highlands of Mars. All were taken by the high resolution camera of Mars Reconnaissance Orbiter (MRO) and can be found in the camera’s archive. I have cropped them to show the same approximate matching area. The first image in that strip above, shown at higher resolution to the right, was taken in June 2011 and titled “Possible Gully Features” by the MRO science team. This is not surprising, as the rounded hills in this image are actually the southwest rim of a large crater, and the slopes of craters have been found one of the best places to find the gullies where seasonal changes occur, all possibly caused by underground water. From the title, it appears that the science team might have first hoped to spot either slope streaks or recurring slope lineae, the two most intriguing of these changing features. 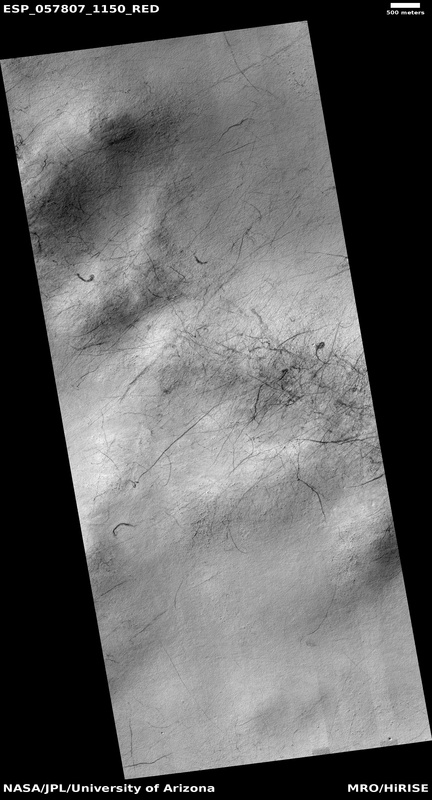 Instead, that 2011 image showed them a very eroded crater rim with a small scattering of dust devil tracks. This lack of gullies probably reduced interest in this location. It wasn’t until seven years later, in November 2018, that the MRO team decided to take another image of this location (the second image in the strip above and shown to the right at higher resolution). This time they found a significant increase in the number of dust devil tracks. At this point the decision must have been made to take another image of this location a month later in December 2018. I assume the scientists were curious to see if they would spot any additional changes in that one month period. This was dust devil season, so the likelihood of seeing more tracks was not unreasonable. How many tracks appeared, and whether they were concentrated in any particular place, such as the ridge lines, would help researchers better understand what generates them, which in turn will give them a better understanding of the Martian atmosphere. 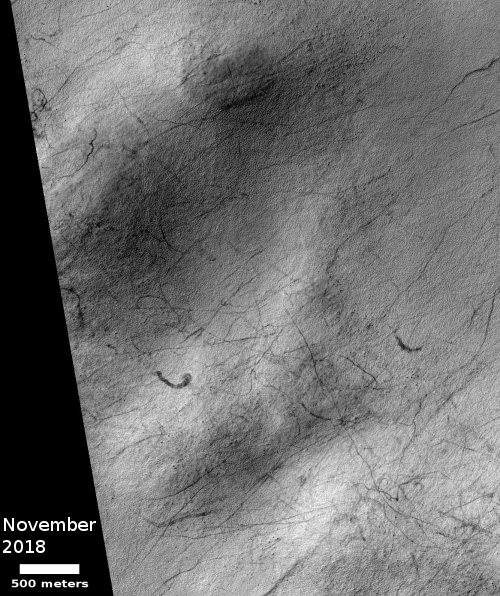 Dust devils and radiation in Gale Crater.